The conclusion of my San Francisco Movie Tour experience. Read Part 1 here and Part 2 here. Golden Gate Park is a rectangular park spanning 3 miles wide by 1 mile tall and is 20% larger than Central Park in New York. It is the 12th largest park in the USA. The starship in Star Trek IV: The Voyage Home (1986) is said to land in the park, but the scene was actually filmed at Will Rogers State Historic Park near Los Angeles. A scene from The Pursuit of Happyness (2006) with Will Smith was shot in the Children's Park. The Conservatory of Flowers and the California Academy of Sciences are world renowned attractions within Golden Gate Park. 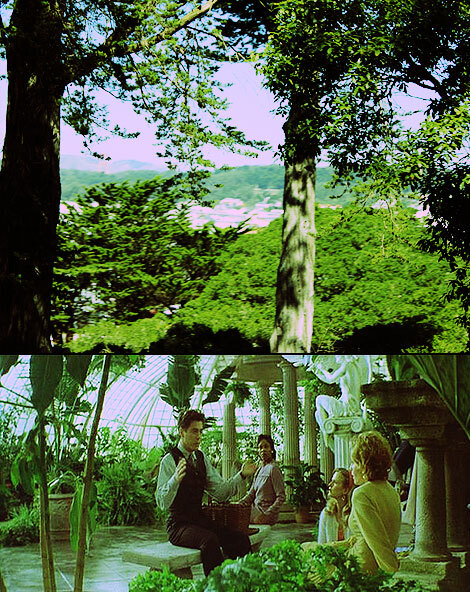 Heart and Souls (1993) with Robert Downey, Jr. was filmed on location at The Conservatory of Flowers. 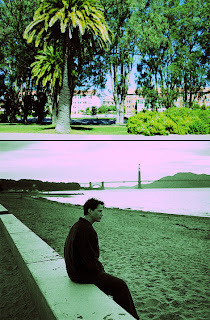 The Presidio of San Francisco was originally a military park and is characterized by many wooded areas, hills, and scenic vistas overlooking the Golden Gate Bridge, San Francisco Bay and the Pacific Ocean. George Lucas, the creator of Star Wars, has recently buil a new facility called the Letterman Digital Arts Center (LDAC), which is now the headquarters of Industrial Light and Magic and LucasArts. The Presidio (1988), starring Mark Harmon, Sean Connery, and Meg Ryan is set in and around the military base of the Presidio. The Golden Gate Bridge is considered one of the modern Wonders of the World. The most notable film appearance includes Star Trek IV: A Voyage Home (1986). 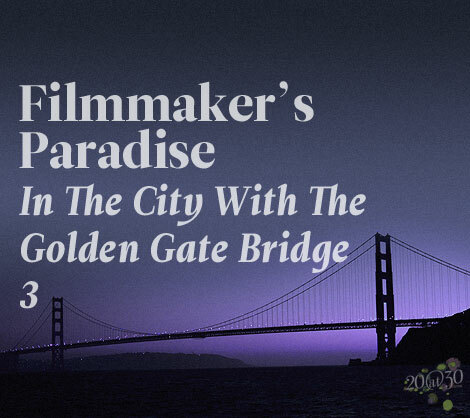 In the Star Trek universe, Starfleet Headquarters and Starfleet Academy are located in San Francisco's Presidio, with a view of the Golden Gate Bridge. Into the future everyone travels the bridge by bicycling and walking covered by an obscuring weatherproof glass arch cover. The Klingon bird-of-prey used by the crew of the Starship Enterprise flies under the Golden Gate Bridge on its way to crashing into the Bay. Later, in Star Trek: Deep Space Nine, the Golden Gate Bridge is destroyed during the Dominion War in an attack by the Breen on San Francisco. Other memorable appearances include : Dirty Harry (1971) "Scorpio" hijacks a school bus full of children and forces the driver to head North across the bridge. Herbie Rides Again (1974) Herbies drives up the side of Golden Gate Bridge. In Superman (1978), Superman saves a school bus about to fall from the bridge. In The Hulk, the Hulk jumps off the bridge to save a fighter jet. 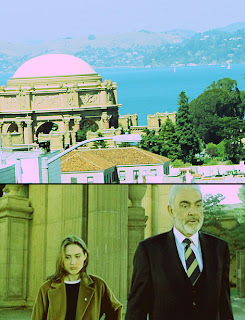 The dome of the Palace of Fine Arts just outside the Exploratorium and the adjacent lagoon have often been used as backdrops. The architecture features a Beaux Arts style with its arch formed by rows of Corinthian columns. In The Rock (1996) - FBI agent Stanley Goodspeed (Nicolas Cage) goes to confront John Mason (Sean Connery) during daylight, who is speaking with his estranged daughter (Claire Forlani) in the dome. The end of our tour ended going through Pacific Heights which is where the elite of San Francisco live. We drove past Danielle Steele's multi million dollar and her 22 cars. We saw where Robin Williams children's private school was. 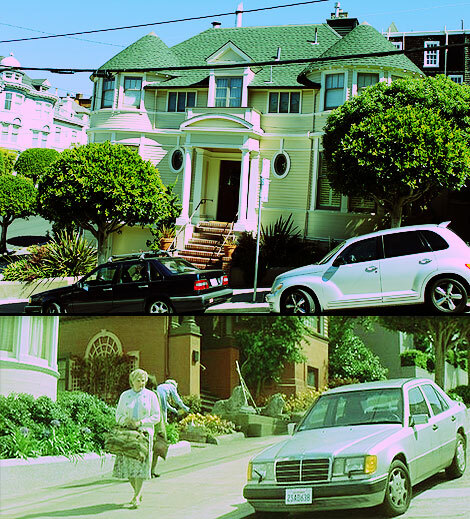 And to end everything off we landed in front of Mrs. Doubtfire (1993)'s house which looks exactly like it does in the famous Robin Williams movie. The exact address 2640 Steiner Street is mentioned in the actual movie and has since become a major attraction. The original owners of the house decided to sell it because of the constant strain of tourists. All in all the movie tour was rewarding because now I can say "I walked the same stairs as Clint Eastwood" or "I climbed the top of Fort Point under the Golden Gate Bridge." It was definitely worth it! For more information about San Francisco Movie Tours visit www.sanfranciscomovietours.com.